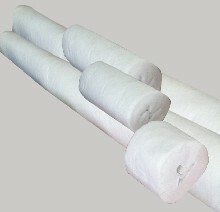 Different roll sizes are available to adapt to different needs. ARCAMESH is a reinforcing isotropic polyester fabric used in conjunction with ARCAROOF, ARCADECK or ARCATHANE. ARCAMESH will consolidate those areas particularly vulnerable and subject to water ingress - from cracks to flashings to construction joints. ARCAMESH is used to repair cracks and breaks present on a wide variety of surfaces: all types of flashings (eave, apron, gable flashings, etc. ), cement or panels used on roofs, gutters, parapet walls, drainpipes, dormers, all masonry joints, construction and expansion joints,roof tiles and shingles. Durable and reinforced protection of all your roof flashings: chimney flashings, gable flashings, ventpipe flashings, valley flashings, roof intersections. Repairs roof tiles, reinforces the waterproofing of parapets, reinforces the waterproof membrane applied over cracks or widely cracked surfaces. The mesh will adapt to the movement of the substrate (in all directions) and resist breaking or cracking. The waterproof coating will have increased tensile strength and mechanical resistance. Arcamesh is available in rolls of different lengths and widths to adapt to your need. It can be rolled out to cover small or very large surface areas. The reinforcing waterproof mesh covers and protects the surface from water ingress through large cracks. Arcamesh bridges and waterproofs expansion joints. The waterproofing system is designed to repair and waterproof a large roof and/or those roof parts which are particularly vulnerable to cracking or crazing and water infiltration. Note: The application instructions are given using Arcaroof. Refer to the different product technical data sheets for application instructions when Arcamesh is used with Arcathane or Arcadeck. Thoroughly clean all active cracks to be treated of all dust, dirt or foreign particles. The crack should be opened up to be at least 10mm wide and 15mm deep. Apply a primer coat (50% ARCAROOF / 50% water) and let dry. Apply a thick coat of undiluted ARCAROOF to each side of the crack and immediately press a cut-to-size strip of ARCAMESH into the freshly applied coating. The strip of isotropic mesh should cover the crack completely (overlapping it on all sides). Apply a 2nd coat of undiluted ARCAROOF over the ARCAMESH, firmly embedding the reinforcing mesh between the 2 coats. Apply a diluted coat of ARCAROOF (50% ARCAROOF/ 50% water) and let dry. Apply a thick coat of undiluted product and roll on the strips of ARCAMESH, pressing each strip into the freshly applied 1st coat. Using a flat plastic trowel, flatten the mesh into the Arcaroof, moving from the centre to the outside corners and chasing out any air bubbles. IMPORTANT: The strips must overlap each other by at least 2 to 3 cm on both sides. Apply a 2nd coat of ARCAROOF and let dry. Apply a primer coat (50 /50 ARCAROOF/water). Once dry, apply a thick coat of ARCAROOF over the crack or flashing and place a cut-to-size strip of ARCAMESH (largely covering the crack /flashing and the surrounding surface), into the freshly applied coat. Apply a top coat of ARCAROOF embedding the ARCAMESH between the 2 coats. Apply a polyurethane sealant to the joint. Smooth the sealant and level the sealed joint. Apply a primer coat over the horizontal and vertical surfaces surrounding the joint (50/50 ARCAROOF or ARCADECK/water) and let dry. Apply a thick coat of undiluted product to the vertical surface and roll down the ARCAMESH to the joint, firmly embedding it into the fresh coat of ARCAROOF. Apply a topcoat of ARCAROOF over the mesh on the vertical surface. Once the vertical surface has been treated, roll the ARCAMESH down and over the horizontal surface. Repeat the instructions (3) and (4) above for application on the horizontal surface. Arcane Industries has been developing,creating , and selling waterproof, water repellent, water resistant, decoration products for over 20 years.